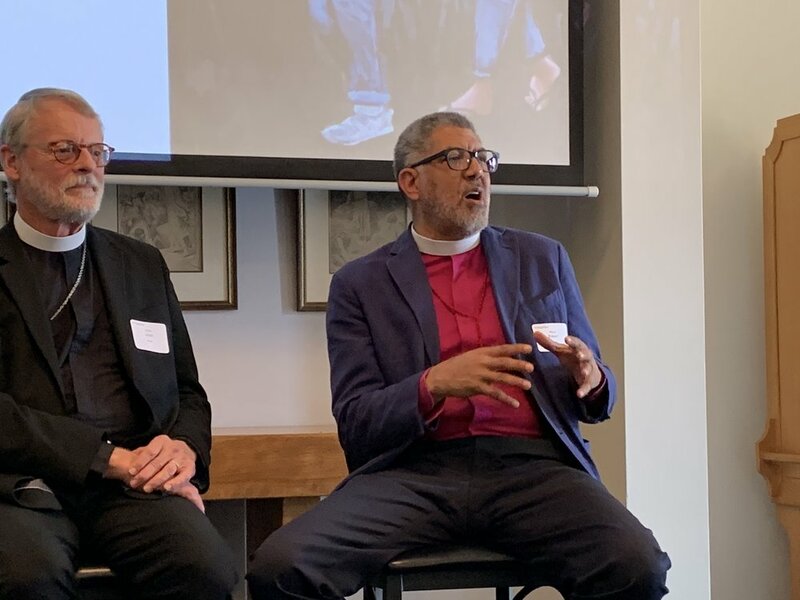 Inspiritus is grateful to have both Bishop Julian Gordy of the Evangelical Lutheran Church in America Southeastern Synod and Bishop Robert Wright of the Episcopal Diocese of Atlanta join us for a Faith Leaders Breakfast this month. The Bishops led a panel discussion on “Immigration and the Welcoming Church” and provided insights for attendees on how faith leaders can encourage their congregations to embrace immigrants and refugees. 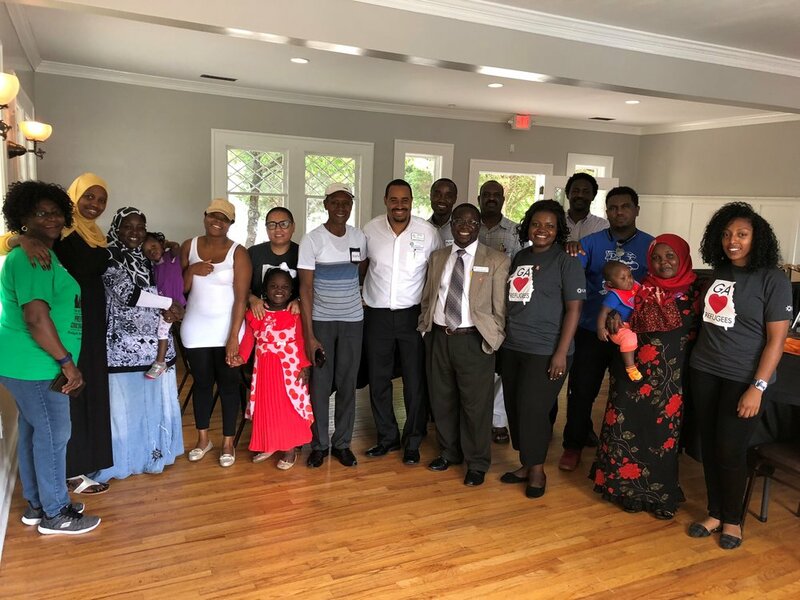 Held on April 10, 2019 at Lutheran Church of the Redeemer in Atlanta, the ecumenical gathering included faith leaders and congregants from Lutheran, Episcopal, United Methodist and Jewish congregations in the Atlanta area and well as others with an interest in immigration related topics. The Reverend Julian Gordy served congregations in Mississippi and Tennessee before his election as bishop of the Evangelical Lutheran Church In America (ELCA) Southeastern Synod in June 2007. A long-time proponent of ministries of mercy and justice, Bishop Gordy has been a voice for immigrants and refugees, serving as the chair of the Conference of Bishops Immigration Ready Bench. 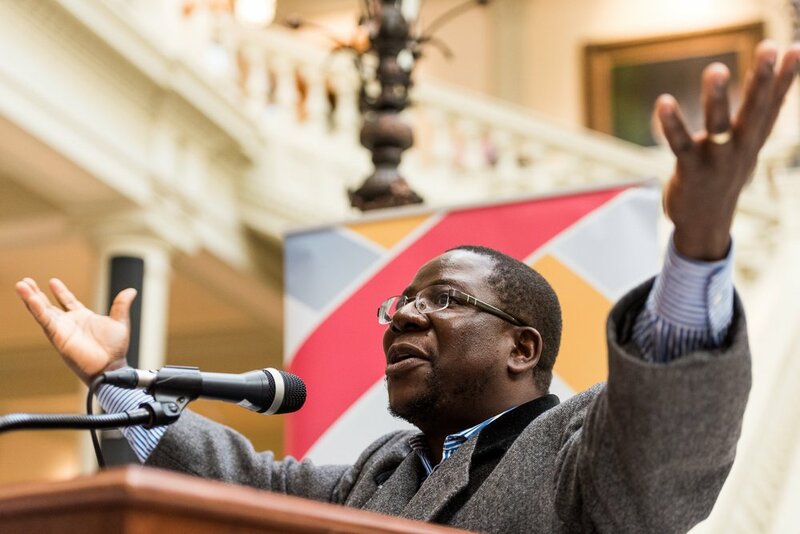 He serves as a member of the Conference of Bishops Theological and Ethical Concerns committee and was a member of the Criminal Justice Task Force, which wrote the ELCA’s social statement on criminal justice reform. The Right Rev. Robert C. Wright is the 10th bishop of the Episcopal Diocese of Atlanta, which covers north and middle Georgia. At the time of his election in June 2012, he had served 10 years as rector of St. Paul’s Episcopal Church in Atlanta. Prior to that, he was a school chaplain and on the staff of the Cathedral of St. John the Divine, New York City. Since becoming bishop, Wright addressed the Georgia legislature about gun control, spoke up for Medicaid expansion and has been a vocal and active opponent of the death penalty in Georgia. Inspiritus has launched a new program focused on ending youth homelessness in Atlanta. 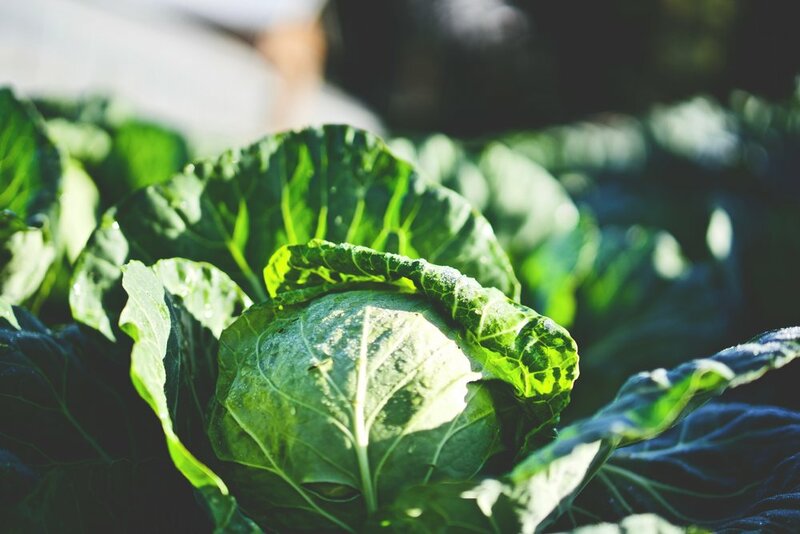 The first program of its kind in Georgia, the THRIVE! Youth Host Home program provides welcoming spaces for young adults (ages 18-24) who are experiencing homelessness to live safely as they figure out their next steps and secure more permanent housing. THRIVE! is designed to be temporary housing, and youth can stay in the host home for as little as a couple of nights up to nine months. 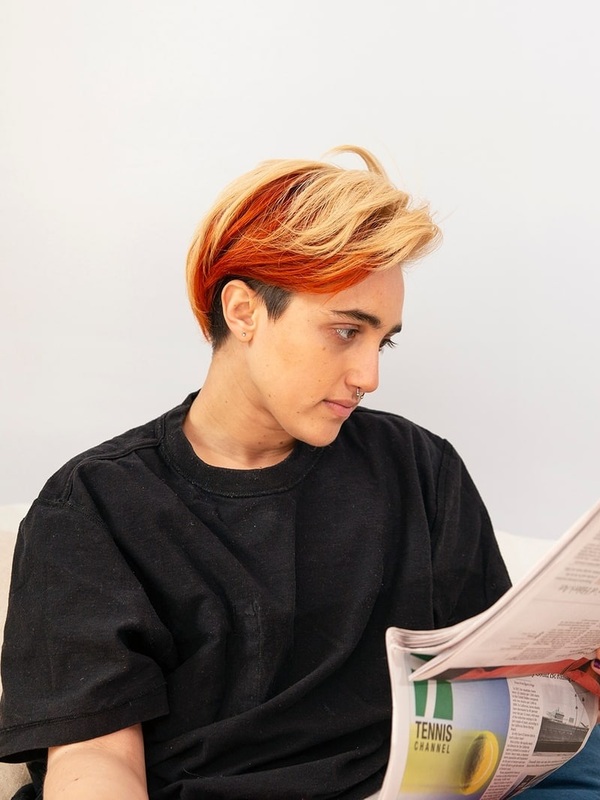 The program places special emphasis on being inclusive and supportive of youth who identify as LGBTQ and youth who have aged out of foster care. In addition to housing, youth in the program will receive ongoing support, including education and employment assistance and other case management services. 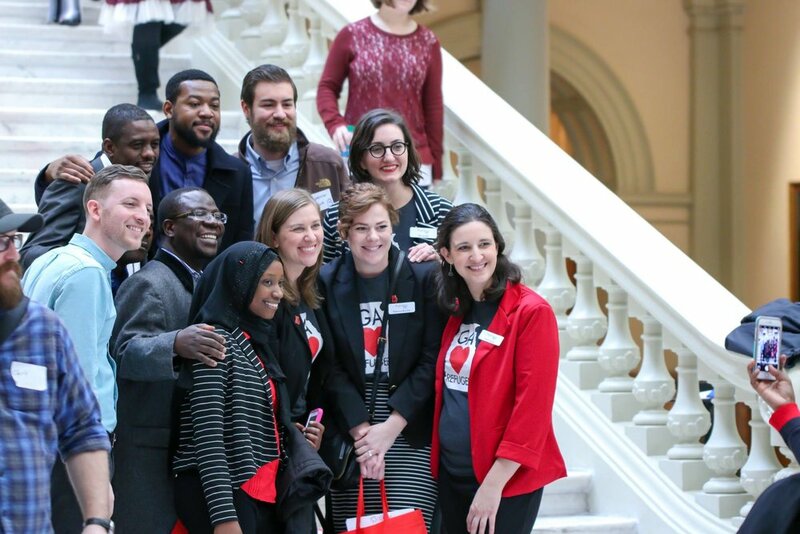 “Inspiritus is honored to have been selected by the City of Atlanta to pilot this youth-focused program, one of many initiatives the city is implementing to reduce homelessness around the metro area,” says John Moeller, CEO, Inspiritus. “One of the aspects of the program that is so special is that it emphasizes youth choice. We’re placing youth in supportive environments based on their needs and goals and preferences around how each individual does ‘home.’” says Alix Janke, Program Manager, Inspiritus. Inspiritus is currently seeking compassionate individuals and families who are interested in opening their home to youth experiencing homelessness. Training is provided. Are you interested in learning more about how you can become a host home or support host homes by donating, volunteering or advocating? Join us for an open house at 7 p.m. on Wednesday, April 24 at Druid Hills Presbyterian Church (1026 Ponce De Leon Ave NE, Atlanta, GA 30306). Registration is not required. MyCanvas Mobile Youth Community Arts, a program of Inspiritus serving middle Tennessee, has been chosen as the featured charity for the March 21, 2019 Nashville Predators game against the Pittsburgh Penguins. During the game, the Nashville Predators Foundation will host a supply and fundraising drive to help support MyCanvas’ mobile art workshops, serving underprivileged youth with limited exposure to arts programming. The following day, March 22, MyCanvas will welcome the public to its annual community art show featuring artwork created by MyCanvas youth artists over the past year. Held from 4:00-7:00 p.m., the art show will take place at the community room at Cheatham Place (1564 9th Avenue North, Nashville). “MyCanvas workshops offer art-based opportunities for children and youth to explore and develop their talents, find their voice, and tell their stories with confidence,” says LeeAnn Love, Lead Art Therapist and Co-Founder of MyCanvas. 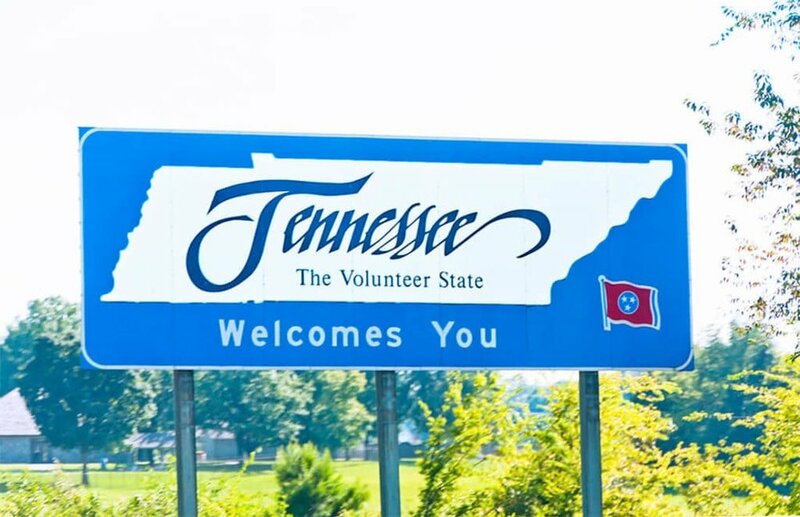 “We are grateful to the Nashville Predators for choosing MyCanvas as a featured charity. 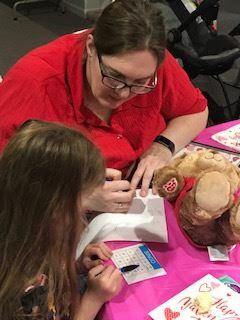 The fundraising drive at the March 21st game will supply MyCanvas with the materials and resources needed to continue our work of fostering self-esteem, self-confidence, and community resiliency through art,” says Janet Arning, Regional Director of Inspiritus’ Middle Tennessee region. MyCanvas offers mobile art therapy experiences to youth in low income neighborhoods in middle Tennessee. 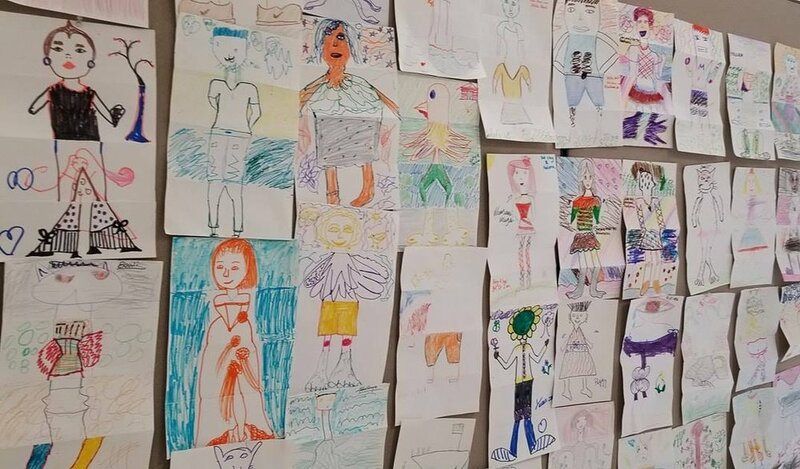 MyCanvas art therapists work to help youth develop their own identities and self-esteem, learn healthy coping skills, and build community resiliency. Art engages creativity, imagination, and self-expression, but it can also be a powerful tool for change and healing. MyCanvas nurtures self-esteem, self-confidence, and community resiliency through artistic creation and expression, all provided free of charge to participants. Inspiritus is a 501(c)(3) nonprofit organization that guides individuals and families on a path from surviving to thriving. Inspiritus empowers people whose lives have been disrupted to discover their strengths and resilience, accompanying them as they grow into vibrant contributors to their community. Inspiritus delivers quality social services programs in the areas of Community Enrichment, Adoption, Specialized Foster Care, Family Intervention Services, Disability Services, Refugee and Immigration Services, Disaster Response and Financial Empowerment to communities in middle Tennessee and statewide in Georgia. At Inspiritus, our refugee and immigration team recently launched a Refugee Youth Career Pathways (RYCP) program in the metro Atlanta area, and we are looking for volunteers to mentor and share their career experiences with teen and young adult refugees. The RYCP program is designed to guide and assist young men and women ages 16-24 who are interested in pursuing skilled and professional careers in a variety of fields. Mentors will work with refugee youth to assist them in identifying their career goals, developing job readiness skills, and learning more about their career of interest. Want to learn more about this opportunity to have an impact on the future of a refugee teen or young adult? Please join Inspiritus for our Refugee and Immigration Services Volunteer Orientation on Sat. March 2nd or Sat. April 6 from 9:30 -12:30 am. We will be discussing this new volunteer to serve as a Refugee Youth Career Pathways (RYCP) Mentors. Click here to register for March 2, 2019 Inspiritus Volunteer Orientation! 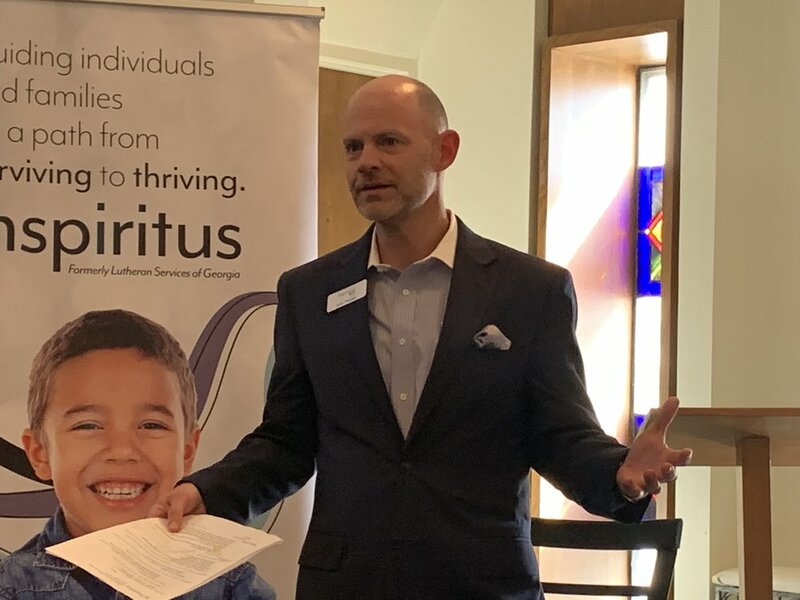 Click here to register for April 6, 2019 Inspiritus Volunteer Orientation! 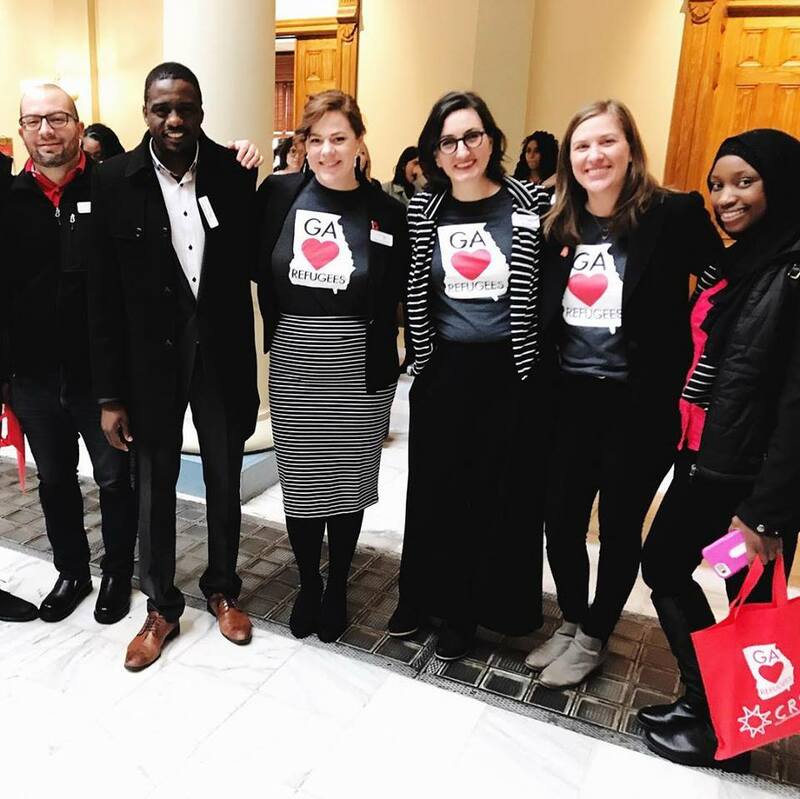 On February 14, Inspiritus staff, Board members and supporters joined with hundreds of others in support of refugees during the New Americans Celebration at the Georgia State Capitol. Organized by the Coalition of Refugee Service Agencies (CRSA), this day of advocacy and celebration gives participants a chance to meet with their Representatives to share why they are passionate about welcoming refugees in Georgia and urge them to support refugee friendly policies and laws. Inspiritus employee and pastor of Good Samaritan Ministry Crispin Wiljonda spoke during the press conference portion of the event. Crispin shared his inspiring story as a former asylum seeker now U.S. citizen and highlighted the important contributions refugees and immigrants brings bring to our state and our country. On Monday, January 21, Inspiritus, formerly LSG, held its 10th annual MLK Day of Service at Christ the King Lutheran Church in Peachtree Corners. 270 volunteers filled the fellowship hall to assist in 21 service projects benefiting people served by Inspiritus as well as projects hosted by local Lutheran churches. Their service will have a lasting impact on those we serve and those served by churches in our community. The day began with the dynamic and inspiring Fearless Dialogues program, which trains and empowers participants to engage in hard heartfelt conversations that see gifts in others, hear value in stories, and work for change and positive transformation in self and other The whole-hearted participation of everyone in the Fearless Dialogues program made for a powerful experience of growth and connection. December is traditionally a month brimming with color and light. In its one-of-a-kind style, this holiday season Savannah charmed locals and tourists alike with decorative accents highlighting classic architecture, tunes of joviality spilling onto the streets at all hours and, most impressively - and unforgettably - caring community members giving testament to the phrase, "goodwill towards men". Staying true to tradition, Inspiritus, formerly Lutheran Services of Georgia, organized its annual Hope Tree program, a gift-giving drive to bring cheer to its clients - refugee families, foster care and adopted children, disabled adults and at-risk youth. After sharing a wish list of what each client hoped to receive, for days and days and days Inspiritus staff welcomed a stream of "sleighs" dropping off the fruits of Santa's workshop. Those of us receiving the bounty couldn't contain our astonishment. "Did the baby really just get new clothing and toys and a gift card to boot?" "Just look at the quality of these girls' clothes!" "Imagine, a sorority raising hundreds of dollars for our refugee families." All in all, members of 7 churches, a preschool, a sorority plus 4 individuals meticulously purchased and wrapped 210 gifts in the sparkly colors of the season. Loving kindness ripples far and wide as we were reminded of our better angels by the community's outpouring of goodwill to all. It’s been a busy fall for LSG’s Circle of Welcome teams! The volunteers have taken time recently to share fall traditions and fun with the refugee families resettled by LSG. What is Circle of Welcome? Circle of Welcome is a program that pairs a community or faith group made up of 5 to 10 volunteers with a recently resettled refugee family. 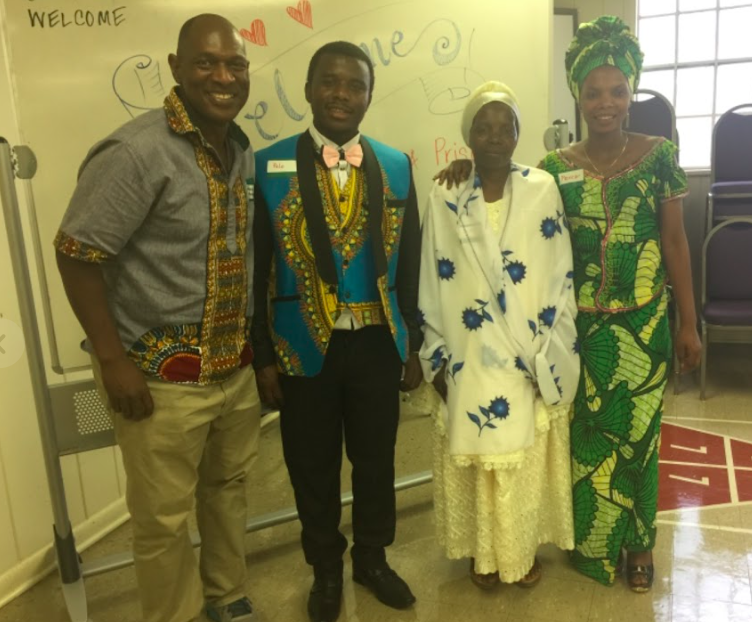 The Circle of Welcome team walks along side the family in service, friendship, and as advocates for the refugee family’s first year in the United States. In addition to working with the refugees on building essential skills and knowledge such as English language skills and providing assistance navigating the education, healthcare and other systems, the Circle of Welcome groups introduce their families to American cultural traditions, and, of course, have fun! Here’s a glimpse into what our current teams have been up to lately! Members of the Triad team—comprised of Rock of Ages Lutheran Church, Living Grace Lutheran Church, and Resurrection Lutheran Church—trained their family in hurricane preparedness just in time for Tropical Storm Michael. They have also been busy sewing with and for the family so that the kids can bundle up as the weather gets colder! Members of Trinity Lutheran Church’s team enjoyed fundraising for the Circle of Welcome family during their annual Oktoberfest. They also had fun introducing the kids to Halloween through a Trunk or Treat experience! 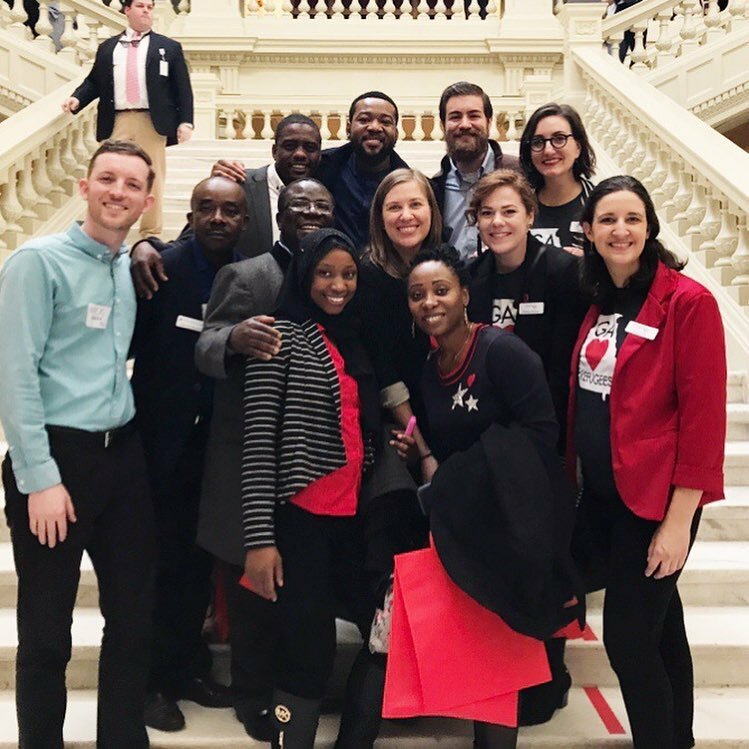 Our newest Circle of Welcome team formed through the Lutheran Outreach Partnership of LCMS and ELCA churches in the Atlanta area. Volunteers from Rivercliff Lutheran Church, Prince of Peace Lutheran Church, and Faith Lutheran Church are preparing to welcome a refugee family scheduled to arrive in Atlanta just in time for Thanksgiving! Will your faith or community group be the next to embrace refugees in friendship and love through Circle of Welcome? Email Janelle jmoore@lsga.org to learn more! As our neighbors in North and South Carolina deal with continued massive flooding and begin to assess the damages left by Hurricane Florence, we at LSG are praying for their safety and for a full recovery from the devastation we’ve seen in photos and videos. Last week marked the one year anniversary of Hurricane Irma’s landfall in Coastal Georgia. Irma arrived just 10 month after Hurricane Matthew hit the coast, and many homeowners on Tybee Island and the surrounding area were still dealing with damages from Matthew. When Irma brought more flooding and destruction, residents were overwhelmed and disheartened to begin the long recovery process all over. In the weeks following Irma, LSG began meeting with homeowners and assessing property damages. Though Coastal Georgia was spared the worst of the storm, it was clear that the need for our help was still great. Since then, LSG has been working with families in Coastal Georgia to help restore their lives following the 2017 storm. We couldn’t do it without the help of volunteers teams from around the state who assist on these recovery projects. 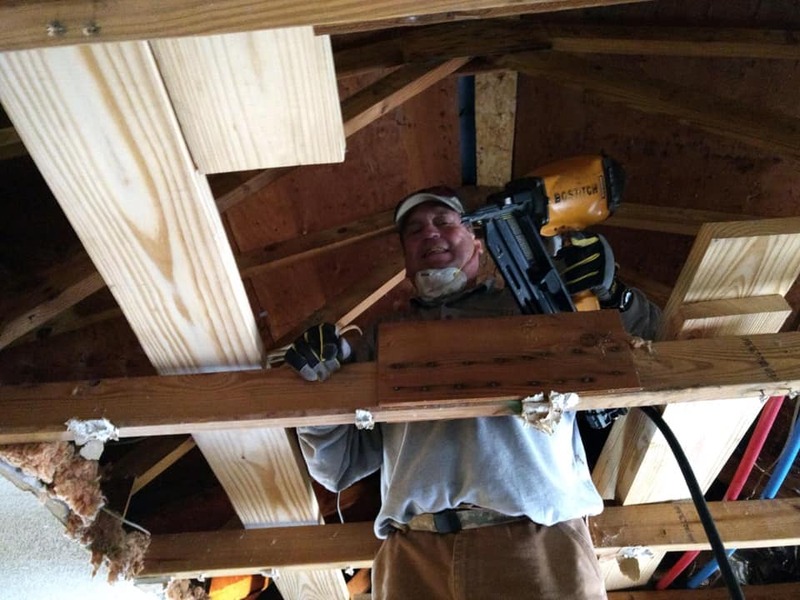 In August, a team of volunteers from Acworth United Methodist Church in Acworth, Georgia travelled to Coastal Georgia to assist in repairing a home damaged by Hurricane Irma. The home belongs to Ms. Ruth*, an elderly woman who lives in downtown Brunswick. A tree fell through Ruth’s home during Hurricane Irma, allowing in rain and causing extensive damage to the interior of the home and ruining much of her belongings. Ruth* had been living with a tarped roof and water damage and mold since the storm hit last September. Thankfully, the roof was repaired in early August, and these volunteers came to help with the interior repairs. “As you know, Jesus taught his disciples to feed the hungry, clothe the naked, and otherwise serve those in physical need. When natural disasters devastate communities, people with few resources are unable to recover on their own. So we started forming a disaster response team roughly a year ago at Acworth United Methodist Church to help meet this need. We spent the last year organizing, training, and planning; our trip to Brunswick was our first chance to actually serve hands-on. Our team removed ruined ceilings, insulation, walls, cabinets, kitchen fixtures, and carpet, replaced some rotted structural wood, and treated the studs to prevent/eliminate mold. We also helped Miss Ruth sort through belongings to clear rooms for demolition & construction work. It was exhausting work, but we found it deeply rewarding to help a person in such dire straits. Seeing the condition of Miss Ruth’s home also raised our awareness of how richly we are all blessed. We will continue to pray for Miss Ruth and hope to return to Brunswick soon to continue work on her home. LSG thanks the team from Acworth UMC for their hard work on Ms. Ruth’s home and their continued prayers! LSG will have opportunities for groups to volunteer with home repairs throughout 2019. For more information, please contact Lauren Cruickshank at lcruickshank@lsga.org. 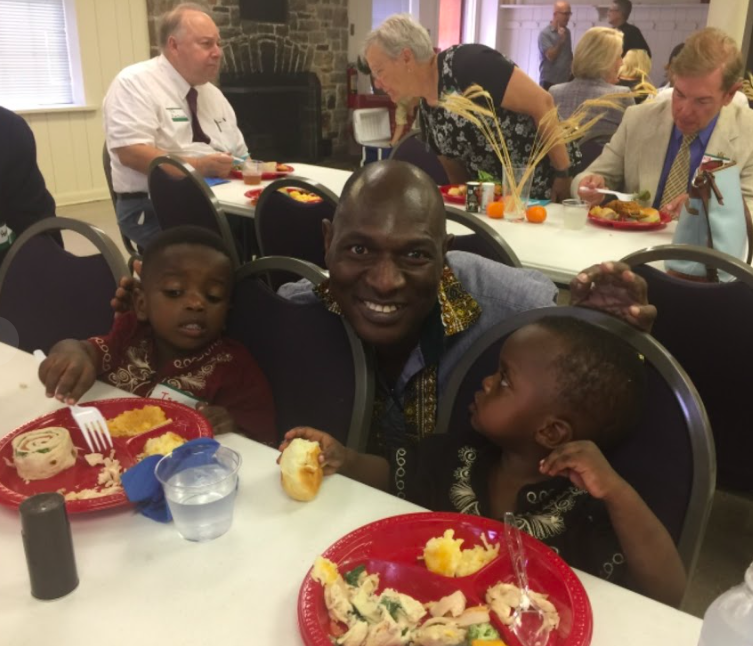 When the Circle of Welcome volunteers from Redeemer Lutheran Church learned that they would be paired with a young, African family coming to the U.S. in less than a month, they were filled with gratitude and anticipation. 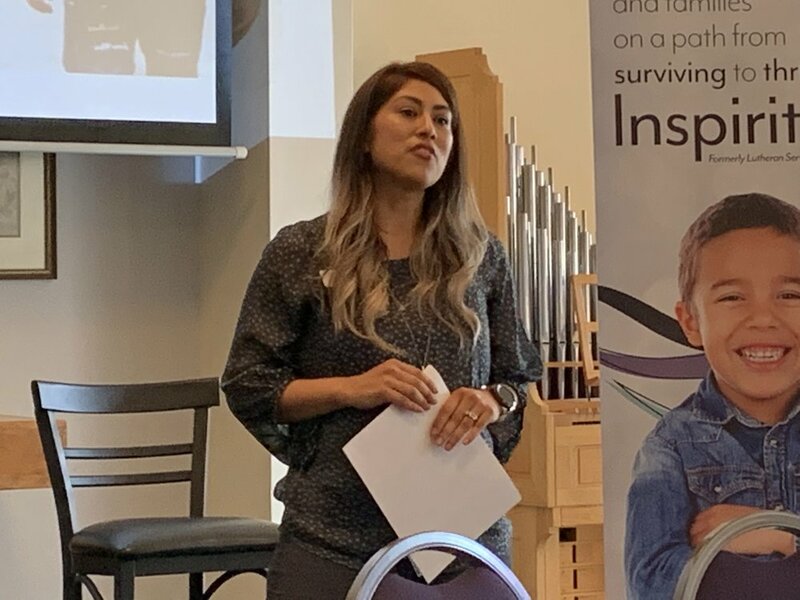 Having recently heard from LSG staff members during a presentation and sermon on Refugee Sunday, the volunteers knew well how few refugees have been able to make it through the system, and they had expected to have to wait for months before the next refugee family arrived in Atlanta. 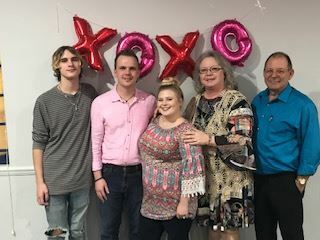 The team flew into action to prepare for the Shabani family’s arrival, mobilizing dozens of other church members to assist with a donation drive to equip the family’s apartment*. They recruited friends from their community with relevant language skills and circulated links to help one another learn about the region and culture of the family. Finally, the big day arrived, and a group of eager Circle of Welcome volunteers assembled at the Atlanta airport to welcome the Shabani family. When the young couple with their two toddlers walked through to the revolving door into the baggage claim area, six Circle of Welcome members were there to greet them, along with several of the family’s relatives who had been resettled a few years before. Soon, the Shabani’s were hugging and laughing with the Cirlce team. Will your faith or community group be the next to embrace refugees in friendship and love? Email jmoore@lsga.org to learn more! *Family name has been changed for the protection of their privacy. I sat down across from Amare*, watching his little face as tears streamed down his cheeks. A few days into our first week of camp, it had been a rough morning for my newest elementary school friend. He was having a difficult time adjusting, unsure of himself and his new surroundings. I sat and listened as he told me about his home country. He described the food they ate and the games they played. I got teary eyed listening to him share pieces of his experience. We laughed together as he reminisced about fun times with his cousins, grandparents, and their farm. We were sad together as he shared how much he misses the extended family he left behind. Their home country remains unsafe for him and his family, but it is home nonetheless. He worried about being the only child at camp from his home country and the only one who speaks his language, unsure how to make friends when he struggles to communicate and doesn’t know who to trust. The words that came to mind as we sat together, reflecting on his journey in games and drawings, were fear, grief, transition, adjustment. However, the biggest was isolation. It’s in moments like these that I am reminded why we do the work that we do, how we truly are the hands and feet of Jesus. We are called to embrace and love the foreigner, to welcome them. For, if we do not, who else will? For many, summer camp may simply be an opportunity to get their kids out of the house during the summer stretch, but for these children it is a source of needed connection and community. It is “welcome” to them! During Camp Mosaic, the children are encouraged to seek, celebrate and embrace all of our stories and cultures, painting a greater story as a mosaic of our community. Children from around the globe stepped into camp with cultural and ethnic walls, only to leave camp with deeper friendships and an empowered strength that allowed them to embrace their differences. At the end of our first year of camp, I am in awe of how Camp Mosaic served to paint a broader picture of community, crossing borders and mending hearts affected by conflict on a personal level. As I was driving camp carpool one morning, I discovered that I had two children from different sides of the same international conflict in the back seat of my 4Runner. The children jumped into my car, excited to share news from their home countries. Their leaders had met, hugged, and decided to move forward in peace. The kids were elated, sharing their joy that conflict was over. They were grateful that family members in their home country had been able to reconnect with friends and family from the opposing side after years of being forbidden to contact them. Peace and reconciliation had started in the backseat of an SUV during camp carpool weeks before, but was being evidenced in the celebration of two children in Clarkston, GA regarding international issues of their home countries. As I prepare to go back to Clarkston High School for our 2018-2019 after school program, continuing the work we began at Camp Mosaic, I am reminded of my elementary school friend Amare. You know, the one with the tear-streaked cheeks? He is starting school this week. But, he will not begin in the way he began camp. Now Amare has a sense of belonging and connection. Through Camp Mosaic, he experienced the fruit of welcome and the bridging of gaps that helped him make friends. He is no longer alone in his community, for he found his place of belonging in a greater mosaic that is the Clarkston story. Thank you to all who partnered in donating time, space at Living Grace Lutheran Church, sports equipment, and many other things! You played a key role in helping our kids thrive as they step into a different season of their stories, something that will serve as foundational in their ability to not just survive, but to thrive. Thanks to your support, we had a wonderful summer! Launched this summer, Mosaic is a trauma informed and resiliency development summer day camp, created to help refugee and immigrant kids aged k-12 to adjust to life in the United States. Kids also had the opportunity to be assessed for PTSD, anxiety, and other clinical mental health barriers they might be facing. In addition to receiving mental health support, kids were given one-on-one reading and literacy instruction, lessons in science and technology, math lessons, as well as opportunities to engage in therapeutic art and journaling activities. Teens in the program were given leadership roles, allowing the chance to complete required community service hours for high school graduation, as well as opportunities to feel empowered in their skills and abilities to lead. The children went on numerous field trips, giving them a chance to explore their new community and city, including a trip to Zoo Atlanta, which hosted a backstage tour just for our children. As the Administration prepares to announce the refugee admissions ceiling for FY 2019 next month, reports have emerged that the White House is considering another drastic reduction in the number of refugees the United States will admit. Yesterday the New York Times reported that the Administration is discussing one plan that would reduce the current refugee admissions cap by more than 40 percent – setting the limit for refugee arrivals at just 25,000. Lutheran Services of Georgia urges the Administration to continue our nation’s proud tradition of welcoming refugees and asylum seekers and to raise the refugee admission ceiling for FY 2019. The United States as long been a beacon of hope for persecuted and displaced individuals from around the world. In the midst of the current refugee crisis, we are saddened that as the number of people who have been forcibly displaced increases, the United States continues to decrease the number we admit. We believe our country and our state are better because we have welcomed these mothers, fathers, sisters and brothers. We celebrate the many contributions refugees bring to our communities – from their work ethic and entrepreneurial spirit to the tax dollars they contribute and their positive impact on our economy. In FY 2018, the administration cut the ceiling for refugee arrivals from 110,000 to an unprecedented low of 45,000. Lowering that number to 25,000, if implemented, would reflect more than a 77% decrease to the U.S. refugee ceiling in just three years. For the last several months, our national partner LIRS has been leading an advocacy effort to encourage the Administration to set the refugee ceiling at 75,000 in FY19. To learn more about how to advocate for refugees and to contact your Representative and Senators, visiting lirs.org/raise-the-ceiling. Stay up-to-date with LSG's refugee and immigration program by signing up for our e-newsletter Crossing Oceans.